In New Orleans just before Hurricane Katrina hits, a pregnant woman gives birth prematurely. She dies and her baby is in critical condition. The baby has to be kept in a neonatal incubator. When the hurricane strikes, all the power goes out and everyone in the hospital leaves. But the baby’s father stays because the baby can’t be moved so he has to take care of his baby by making sure the ventilator stays on. And because there’s no power, the only power source is generator that he has to crank every few minutes. 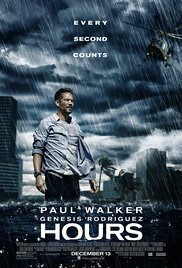 Those who love minimalistic movies will praise this one with Paul Walker. Although he’s not exactly the person they were thinking of to play in such a movie. The events are fairly limited : a newborn baby, a mother who dies while giving birth, a father left behind speechless, a ventilator in a nursing room of a few square meters, an upcoming storm and a backup battery which obviously is not working properly. How can you make a movie with only that ? With “Hours” they show you how ! A little morbid to watch this movie after the passing of Paul Walker. I started watching it on a Saturday afternoon because it was still in my “movies to watch”-list and continued the next Sunday after hearing the sad news. I ‘m not a big fan of Paul Walker. “The Fast & The Furious” series of movies are nothing for me . I’m not a car fanatic and watching glitzy drifting cars is not my thing . This has the same effect on me as watching a movie about brilliant chess tactics. I found “Vehicle 19” a lousy movie and after 20 minutes I stopped watching “Pawn Shop Chronicle” because it started to work on my nerves with that hyperkinetic blabbering. But “Hours” touched me, and captivated me despite the minimal story. And frankly, Walker showed he actually could play a character part. The race against the clock from a father who wants to keep his newborn daughter alive at all costs. Desperation, fatigue, hope and an immense sadness caused by the loss of his wife. All these emotions were played, not in a masterly way, but still in an excellent way by him. Luckily the only moving vehicle there was an ambulance with a dead battery. In contrast to his own life, this movie does have a happy ending . “Hours” . It’s not a thrilling movie that puts you on the edge of your seat. But a movie that showed that Walker was more than the glitzy blue-eyed handsome guy who beamed when he was driving an expensive sports car . Someone who could even handle an emotional part . Too bad he can’t achieve such an excellent performance anymore. R.I.P. Paul Walker !